Ships Friday, April 26 if ordered in the next 1 hour and 25 minutes! 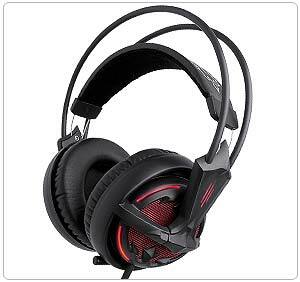 The matte black headset features "demon" red, LED illumination. Featuring 50mm driver units that reproduce crystal clear sounds in high, low, and mid-range tones, the SteelSeries Diablo III Headset is at the core of creating an incredible Diablo III audio experience. Whether it's the ominously-toned soundtrack, the approaching hiss of a Witch Doctor's firebomb, or the bloody rage of a Barbarian whirlwind, users will clearly hear the gut-wrenching hurls and exploding innards of your enemies. Alert the world around you that you're in the game. 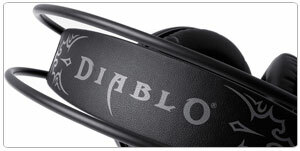 The matte black headset features "demon" red, LED illumination on the right and left side Diablo III logo slashes, and around each earcup. Choose your level of pulsating glow, or if lights don't interest you, easily turn it off via the SteelSeries Diablo III Headset software. Don't worry, it's not the Burning Hells that power this bad boy, but a total of 18 LED lights to power the red illumination and 4 pulsation options. Let's face it, the way you hear the game is unique to the tones your hearing can pick up, and probably completely different than the next gamer. So SteelSeries provides Diablo III Headset users the ability to adjust, personalize, and save all of their audio and equalizer settings. Save up to 8 settings for specific character profiles, all using the Diablo III-themed driver and software. The software provides a Diablo III themed interface for the Diablo III gaming mouse (sold separately) and headset. The software opens a mock 'class selection screen' with which you can tie profiles to your specific characters in-game. Use the software with the Diablo III headset to adjust equalizer settings, microphone volume, microphone noise reduction, illumination pulsation, and illumination intensity. The earcups feature a leather-covered, noise-reducing foam, which helps you to focus on important audio or voice communication without being disturbed or interrupted by outside noise. SteelSeries' over-the-head suspension design keeps the Diablo III Headset cans lightweight and adjustable for just about every head size. Keep the gameplay heavy, not the gear you're wearing to play it. 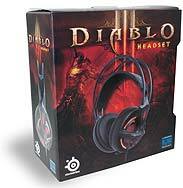 The Diablo III Headset features a retractable microphone system. Pull it out when you need it. Hide it in the left earcup when you don't. The integrated volume controller on the cord offers also offers a mute button, all for instant control without having to navigate through software settings. SteelSeries Diablo III Gaming Headset, manual. Return Policy Guidelines: - All electronic returns require the serial number off the item for processing. RMA request may be submitted without this information, but may be delayed or rejected. Please provide the serial number in the RMA notes field if possible to avoid any issues. 2. Refuse the shipment (if possible) so that it is returned to us for freight claim processing. If damaged item is accepted via UPS/FedEx Ground, contact us for freight claim to be issued; if via truck/LTL, the receiver is responsible to place the claim with the carrier within10 calendar days of receipt. Damage claims are the responsibility of the co-signee. The shipping cartons, packing and content should be retained in the same condition as received, this will be needed for claim to be processed. Nikastic.com does not provide return labels for this particular item. Please note that if the package is refused, undeliverable, or returned to sender for any reason, the credit will be minus original shipping, return fees, and restocking. All returns are for refund only. Replacement product must be ordered again as a new order with a new order number and will include freight and handling charges. Review "SteelSeries Diablo III Gaming Headset"